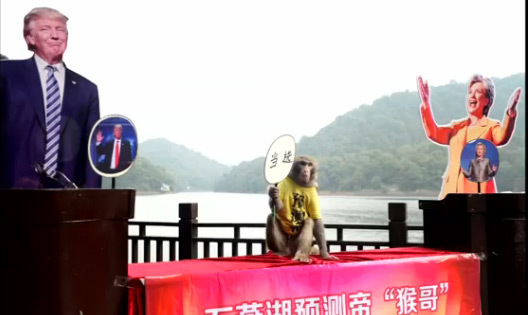 2 Geda, a 5-years old male monkey in Changsha, has predicted that Republican candidate Donald Trump will be the next U.S. president. Geda, a 5-years old male monkey in Changsha, has predicted that Republican candidate Donald Trump will be the next U.S. president. Geda, wearing a yellow shirt that says “king of prediction” stood on a table between cardboard cutouts of Trump and Clinton at a tourist destination in Changsha. Holding a sign that said “elected”, the monkey, following the path of Paul the Octopus, moved and kissed Trump. According to Reuters, the monkey has had a successful predictions in the past, such as choosing Portugal as the winner of the UEFA Euro championship. The response clear.